Get ready for an exciting summer! 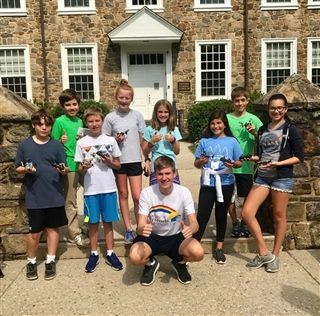 Wilmington Friends Middle School provides a wealth of high quality programming for our campers, a proud tradition since 1996. Whether you are looking for a traditional day camp experience, art programs or sports there is something for everyone! Base Camp is designed as a foundation to build long-lasting camp memories. Much of the day is structured around organized cooperative and competitive games. A rotating schedule of weekly activities includes active games, free art project time, video time, gardening, board games, hiking, fishing and access to our gyms and game room. Games and activities change daily to keep campers engaged. Each week, campers will enjoy one of the many field trips, including Bowlerama, Delaware Greenways Trail, Wilmington Skating Club and Bellevue State Park. In addition, campers will have the option to cool off each week at Valleybrook Swim Club. Campers will also have the opportunity to join students from our theme camps for breaks, lunch and combined activities.